We all know how vast and diverse Chinese cuisine is. From how rice is prepared, noodles are cooked, up to the various ways meat is prepared, there are always a lot to choose from. But their choice of cooking equipment is another story. Most of the time varied dishes are cooked with just a single equipment, like a Wok. A prime example would be the use of the best Chinese chef knife in preparing almost any dish. Due to its design, a Chinese chef knife, also known as a Chinese cleaver, is more versatile than the already all-around chef knife. Aside from being able to do all the tasks of a regular knife, it also has the sturdiness to chop big pieces of meat and bones. The variety of tasks it can do ranges from making paper thin slices, peel the skin of fish and other meat, up to cutting up through bones. In this article, I reviewed the top five Chinese chef knives available so it would be easy for you to decide. Why should you get a Chinese chef knife? How To Choose The Best Chef Knife? You might already have a chef knife, paring knife and a sushi knife. But adding a Chinese cleaver in your kitchen arsenal can give you these perks. This is the main benefit of having this type of knife. This is a knife that has a sturdy enough blade to cut through rock solid materials and yet lightweight enough to be able to fillet or skin fish, fruits and vegetables with ease. Not only that, but its width can also be used to put chopped items in to carry it into the cooking pot. If you have this in your collection, you can give your other knives a break from all the slicing and dicing. If there are food items that you are unsure if your expensive knife can handle, you can always count on the Chinese cleaver to be able to withstand the impact. If you are into cooking Asian recipes, there is nothing better than doing it with an actual Asian cooking tool. The good thing about this knife is that it is not just good in making Chinese dishes, it is also great in preparing other Asian dishes such as sushi and sashimi. 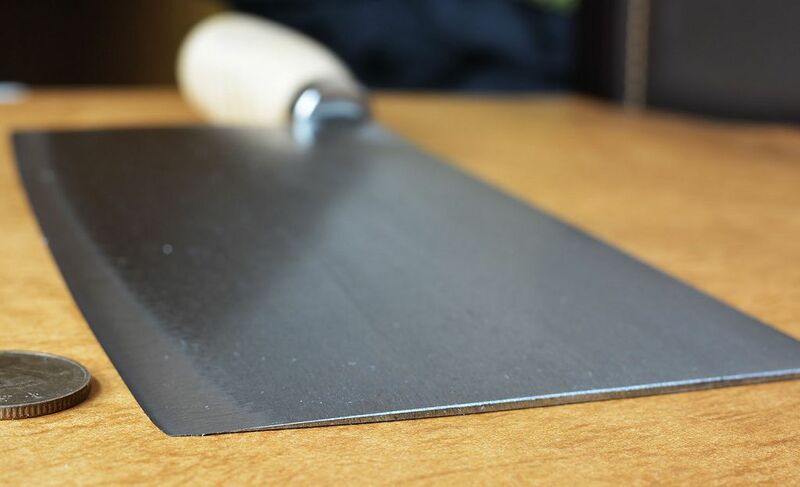 There are certain factors to consider in choosing your Chinese cleaver. Although each of these options has their own strengths, you have to choose the ones that can improve your culinary expertise. Carbon steel is a material that is very sharp and retains its sharpness for a long time. This is ideal for chopping vegetables and soft meat with precision and efficiency. However, if you are into chopping through bones and hard meat, do not choose carbon steel. It can easily chip and break upon impact with hard materials. Stainless steel is the best option for heavy duty cutting. A stainless steel blade can also be as sharp as carbon steel, but it is more useful for cutting through thick skin, bones, and hard meat rather than for making paper thin slices. You also need to sharpen it periodically since it doesn’t retain sharpness as much as carbon steel does. The tang is how the much of the blade is attached to the handle. Full tang means that the end part of the blade extends all throughout the handle. This is the only way to go. With the size of the blade, getting a partial tang is hazardous as it has a high possibility of getting detached from the handle. A wooden handle looks good. It provides a classic feel and elegance in the design. It also provides a good grip. However, meticulous care is needed. A wooden handle should be devoid of moisture to prevent wood rot. It also should be handled with care since a blunt force may warp or chip the wood. Steel handles don’t incur wood rot and won’t have any problem with exposure to moisture and water. And when the knife is a one piece design in which the handle and the blade are just a single piece of metal, it is sturdy and safe. However, the challenge is with the grip. It tends to be slippery especially if you are handling greasy food items. Composite handles such as polypropylene and Santoprene are a combination of plastic and other elements that provide a sturdy compound which is lightweight and provides a good grip. It is not affected by wood rot or rust. But you have to make sure that it is BPA-free and doesn’t have any toxic chemicals in it. As promised, here is my detailed list of the best Chinese chef knives available today. This multi-purpose knife is designed to be sturdy and precise at the same time. It is perfect for chopping bones and large pieces of meat, and yet capable of making thin slices. Despite its bulky frame, it has an ergonomically designed handle that makes it easy to maneuver and grip. The blade is made of 100% stainless steel which is resistant to rust and corrosion. 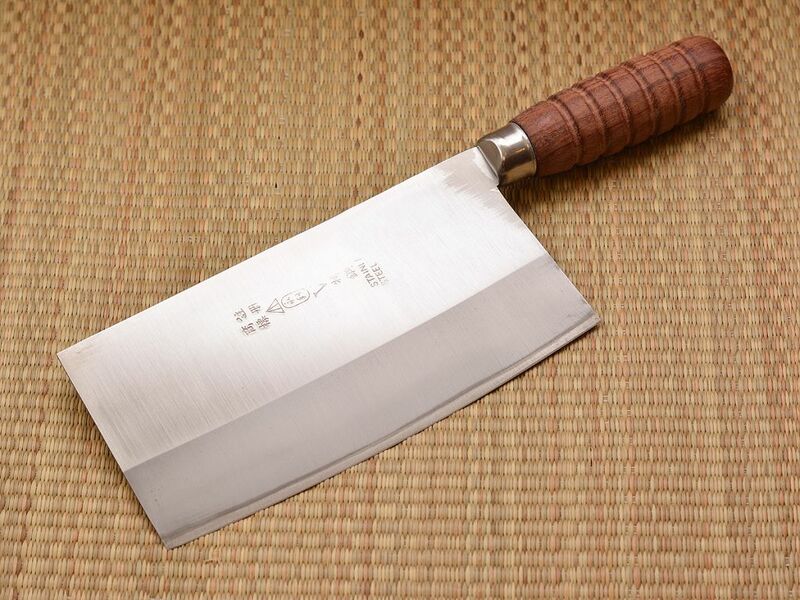 The 7-inch blade is wide enough to chop through large pieces of meat. It has an ABS+430 handle that provides a steady grip and makes it easy to maneuver and control. The knife is dishwasher safe, although hand wash is recommended. The blade doesn’t retain its sharpness for long. Periodic sharpening is recommended. The blade thickens as it goes up to the blunt edge, making it a challenge to cut through meat and other thick food items. You will be able to feel the authentic Asian vibe as you sift through the Japanese characters written on the blade. This knife is made in Japan with high-carbon stainless steel. Add the fact that the handle is made with Japanese oak wood gives it a more traditional and classical feel. That, and its optimal performance in cutting and slicing. The blade is made of high carbon stainless steel that is very sharp and retains its sharpness for a long time. The Japanese oak wood handle is ergonomically designed for a stable and comfortable grip. The knives are made in Japan with high-quality standards. The 7-inch blade can handle most cutting jobs like tough meat and bones. The knife is not full tang, and has the risk of getting detached from the handle. The knife should be devoid of moisture as much as possible to prevent rust and wood rot. This knife means business. It focuses its design on functionality. It has an 8-inch blade, an inch more than its contemporaries, and has a simple wooden handle for an efficient and steady grip. Nothing fancy, just pure chopping power. The blade is made of high carbon steel which is extremely sharp and retains its sharpness for a long time. The wooden handle is ergonomically designed for a steady and comfortable grip. It has an 8-inch blade for a wider range of cutting. This knife is dishwasher safe. The knife is not full tang and the rivets are loose. There is a plastic bolster that sometimes gets loose and accumulated water causing the handle to stain and rot. Just the brand itself speaks volumes on how good this knife is. Mercer is one of the leaders when it comes to excellence in cutlery. The main features of this knife is a shortened bolster so that the full edge of the blade can be utilized and the rounded spine of the handle for a steady grip. It is covered by a limited lifetime warranty for a risk-free purchase. The blade is made of high carbon, no stain, German cutlery steel that is rust proof and stain resistant. The knife has a full tang designed and triple riveted for a safe and steady chopping experience. It has an ergonomically designed Delrin handle with a rounded spine for a comfortable and steady grip. It has a taper-ground edge for precise cutting and easier sharpening. The knife is NSF certified for safety and efficiency. The handle is light that extra force is needed to effectively hew away through bones and thick meat. The single bevel taper grind design of the blade requires specialized tools to be sharpened effectively. Regular sharpening materials might damage the blade. This knife is designed for versatility and function. The 7-inch blade is strong enough to cut through meat and bones, but it is also sharp enough to make precise cuts of vegetables and small food items. Its ergonomically designed handle provides a steady and comfortable grip while the triple riveted full tang design ensures that the blade and handle stay in place. This knife if backed up with a 100% money back guarantee. The 7-inch high carbon blade is heat treated and finished with polished hand satin for a rust proof, stain resistant, and beautiful exterior. The full tang design ensures that the blade stays in place and would not detach from the handle. The blade is triple riveted to the handle for stability and durability. The pakka wood handle is ergonomically designed to for a comfortable and steady grip. The bolster has a small protruding pointed edge that might cause injury to the finger. The handle could be a challenge for those who have large hands. The best Chinese chef knife for me is the Mercer Culinary Asian Collection Chinese Chef's Knife. Aside from being a Mercer knife, it has all the perfect features. It has a very strong and dependable blade, a comfortable and safe handle, and a full tang design. Aside from all of these features, the knife is covered with a lifetime warranty.